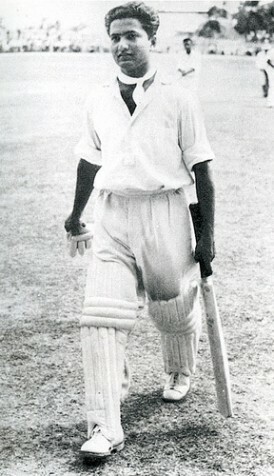 Hanif leaves the field after his epic innings of 337 at Bridgetown in 1958. Are we born with talent or does it have to be acquired? If the former is it a question of chance or can the necessary abilities be inherited? And if the latter how exactly does one go about getting it? I have never been convinced of any explanation I have heard or read about, from either school of thought, but there are plenty of examples in sport, and cricket in particular, of various members of the same family reaching the top level. The names Chappell, Hadlee and Mohammad are perhaps the most obvious but there are many many others. Are all those families’ successes down to nothing more than dedication and hard work or are they, effectively, pre-ordained? There is the other side of the coin of course, and the man who is probably the greatest cricketer of them all is one such. George Bradman was a keen club cricketer, but never scored a century, and John Bradman (later Bradsen) was a decent schoolboy cricketer, and a talented athlete, but he never aspired to the First Class game. Sir Donald on the other hand set records that, seventy years on, have never been threatened let alone beaten. All in all I suspect the answer to my question is that it is a mix of the two, perhaps 20 per cent inspiration and 80 per cent perspiration, but it doesn’t really matter very much as I am going to write about the Mohammad family anyway, and what is not in doubt is that no other family has ever produced four siblings who have all played Test match cricket and, had it not been for an overnight change of heart from AH Kardar on New Year’s Eve 1955, it would have been five. The five brothers are all still with us too. The senior man is Wazir who is 82. The second brother is the unlucky one, Raees, who is 79, and the three best known, Hanif, Mushtaq and Sadiq are 77, 68 and 66 respectively. The family originated in Janagadh, a state in Western India on the Kathiawar peninsula. That same peninsula also contained, Jamnagar, the land of Ranji and Duleep, so there was a great cricketing heritage. The brothers’ father and grandfather were both fine club cricketers, as were a number of their uncles and their mother, the indomitable Ameer Bee, was a champion badminton and carom player. So earlier generations contained sporting talent aplenty. The circumstances of the family were good and they owned a guest house and a petrol pump and, in addition, the father was a manager at a local salt plant, so all three of the elder boys had plenty of time to use the terrace of their home for practising their cricket. Everything changed for the family in 1947 following partition when, after Janagadh initially acceded to Pakistan, the vast Hindu population refused to accept that decision and in the ensuing climate of fear and uncertainty the Mohammads, and many others, left their assets and possessions and fled to Karachi. Sadly the father died from cancer not long after arrival. For a number of years the family lived in a Temple, happily, and able to continue playing as much cricket as they could. It was Ameer Bee who was therefore the driving force behind the unprecedented success of her brood. There is no doubt at all that she was desperate for her sons to succeed, that she took enormous pride in the successes they achieved on the cricket field and that she constantly encouraged them to strive to become the best players they could. That she could also be a hard taskmaster is also clear. The great statistician, the late Bill Frindall, told a story of an occasion when the three older boys were all dismissed without scoring in a First Class match and as a consequence were not allowed in the house for several days. The story must have been exaggerated in the telling, as the worst combined performance I can find for Wazir, Raees and Hanif came in a match against the touring New Zealanders in 1955, but I rather doubt that Ms Bee was too impressed by the total of four runs that they contributed between them, and the vision of the elder brothers being reliant on what scraps of food Mushtaq and Sadiq could pass to them through a window remains an amusing one. It was no doubt a far cry from the reception the three had received from their mother after Karachi’s nine wicket victory in the final of the Quaid-e-Azam Trophy six months previously when each of them had scored a century. Fifteen years on and Ms Bee had cause to be unhappy with Mushtaq when a similar family treble was just missed. In the final of the Ayub Trophy he and Hanif both scored centuries for Pakistan International Airways against Karachi Blues. Sadiq opened the batting for the Blues and got to 96 before he was dismissed, caught by poor Mushtaq, who must have known the sort of reception he was likely to get from his mother. As cricketers all five brothers were batsmen, and all five were right handed. It is therefore a particulary notable achievement for Sadiq to make his mark in Test cricket batting left handed. As a young child Hanif, seeing considerable advantages to lefthandedness, had repeatedly urged him to ignore his instinct to bat right handed. Mushtaq was the one real all rounder in the family, taking more than 900 First Class wickets with his leg breaks and googlies although Raees, who only appeared in 30 First Class matches in his entire career, was also a capable right arm wrist spinner. The new nation of Pakistan played its first Test against India in October 1952. A 17 year old Hanif opened the batting and scored his country’s first Test half century in their innings defeat. Wazir, then 22, joined him in the side later in the series. It was to be 89 Tests, and more than a quarter of a century, before a Pakistani Test side took to the field without a member of the famous brotherhood in the team. Frequently there were two, and once, in October 1969, Hanif, Mushtaq and Sadiq all played against New Zealand. It was Hanif’s last Test, and Sadiq’s first. The debutant out performed both his older brothers. Wazir played for his country 20 times and averaged only 27 – had he not gone to the Caribbean in 1957/58 it would have been just 17, but in that one series of five Tests he scored both his Test centuries, more than half his Test runs, and averaged 55. His other 15 appearances were therefore a little disappointing, but did contain two real highlights. First was his unbeaten 42 in Pakistan’s second innings of the Oval Test against England in 1954. It was the highest Pakistani innings in the match, and while history remembers above all else the magnificent bowling of Fazal Mahmood Pakistan would not have been the first, and still only, team to win a Test in England on their first visit without Wazir’s knock. Wazir’s second momentous innings coincided with another matchwinning performance from Fazal. This time it was Pakistan’s one off inaugural Test with Australia in October 1956. Batting conditions were difficult, the visitors managed just 80 and 187, but still might have won without Wazir’s 67 and his century stand with his captain Kardar, which gave the home side a precious lead on first innings of 119. Turning to Hanif he was known from an early stage in his career as “The Little Master” and although his overall record, just under 4,000 runs from 55 Tests at a shade under 44 does not suggest greatness, the fact that he often stood alone as the only quality batsman in his side needs to be borne in mind. So too does the fact that the period when he should have been in his prime, between the tours to England in 1962 and 1967, was a period during which Pakistan played just 8 Test matches, and all of those in an eight month period in 1964/65. Hanif’s most notable characteristics were his stamina and his ability to concentrate for long periods and his two best innings were both perfect illustrations of this. The first came in the first Test of the series against West Indies in the Caribbean in 1957/58. The two sides had not met before and the home side got off to an excellent start as they spent most of the first two days piling up 579 for the loss of nine wickets. Captain Gerry Alexander declared to give his bowlers a quick burst at the Pakistanis at the end of the second day. Hanif and his partner, Imtiaz Ahmed got through that tricky little session, and indeed survived for the first hour next morning, but after Imtiaz was dismissed the innings collapsed in a heap and the visitors paltry 106 meant they followed on 473 in arrears with, given this was a six day match, the greater part of three and a half days to go. By tea on the final day Hanif was still there, looking forward to beating Len Hutton’s record score of 364. He did not succeed (ironically later that same series Garry Sobers did) but when he was finally out for 337 Pakistan were safe. He had batted for more than 16 hours, a total of 999 minutes (I am taking Hanif’s word on that – cricinfo and Wisden both say 970 minutes) and still holds the record for the longest Test innings by a distance. He shared century partnerships for each of the first four wickets (including one with Wazir), and the innings remains the only Test triple century ever scored in a second innings. It seems improbable that those records will be broken any time soon. The second great innings came at Lords in 1967. As noted Pakistan had played little Test cricket for five years and on their last visit to England, in 1962, Hanif had had a wretched time, failing to record even a single half century and, had the first day of the fourth Test not been lost to the weather, the series would have been a 5-0 victory for England. In the first half of the 1967 season England had beaten India 3-0 and Pakistan were not expected to present too many problems. England batted first and at 282-2 at the close on the first day were cruising. Pakistan would have been pleased at the fightback on day two that saw the home side restricted to just 369, but at 99-6 after an hour of the third morning Pakistan looked like a beaten side. There was still hope while skipper Hanif was there and he went on to play one of the great captain’s innings firstly with leg spinner Intikhab and then, in a famous stand of 130 with Asif Iqbal. When Asif went for 76 Hanif shepherded Wasim Bari and Salim Altaf through another two hours. He was eventually left unbeaten, after just over nine hours, on 187. It was enough to earn an honourable draw. Another remarkable record came Hanif’s way a year after his 337 in the semi-final of the Quaid-e-Azam against Bahawalpur when he broke Bradman’s record for the highest individual score in an innings as he recorded his famous 499. Had Hanif known that Brian Lara would later break the record then one suspects he might have opted to come back the following morning rather than, as he did, find himself run out in the last over of the day trying to get to 500 by the close. The status of a number of First Class matches played in Pakistan in that era is open to question. This is not one of them. Bahawalpur’s attack may have contained just one Test player and it is true that he, Zulfiqar Ahmed, was never a household name, but all of their four main bowlers have perfectly respectable First Class records. As a youngster I saw a good deal of the two younger brothers, who both had long careers in English county cricket. Mushtaq was fascinating to me. As a child there was of course the mystery of the east generally, but most interesting was that this unobtrusive looking little man had made his First Class debut shortly after his thirteenth birthday. He wasn’t there to make up the numbers either. He top scored with 87 and then took 5-28 in the Sindh second innings to bring Karachi Whites an innings victory. Sindh were not a strong side, but given that he outperformed Wazir and Hanif at just 13, that is hardly the point. There are questions raised to this day about whether in truth Mushtaq is a couple of years older than his official record suggests, but I don’t really understand why – after all if he, his mother and his brothers don’t know who on earth can be trusted to get it right? Mushtaq went on to make his Test debut just two years later, and while that game was not a memorable one, two years on he set a record for the youngest Test centurion that even Sachin Tendulkar could not better (although Mohammad Ashraful subsequently did). Another century in England in 1962 meant that he had two before his nineteenth birthday, and he was one of Wisden’s five Cricketers of the Year in 1963 – Hanif had to wait until 1968 for that honour. Mushtaq missed Pakistan’s few Tests in 1964/65, he was in England acquiring the residential qualification that led to him playing for Northamptonshire for more than a decade, but he picked up his Test career in 1967 and he ended up with a batting average of fractionally under 40 for his 57 Tests and his 79 wickets cost him less than 30 runs each. To this day, Wasim Akram and Imran Khan notwithstanding, Mushtaq is the only Pakistani to have scored a century and take a five-for in the same Test on two occasions. I always enjoyed watching Mushtaq play. He might have had the same cricketing upbringing as Hanif but he did not treat his contest with the ball as a battle of attrition. There were not many players from the subcontinent in the English game when Mushtaq joined it and his wristy strokemaking, coupled with the fact that he was always looking for runs, made him one of the most popular players in county cricket. He was the first, and for many years only batsman who I saw play the reverse sweep. I was surprised to learn, not many years ago, that he was taught how to play it by the seemingly totally orthodox Hanif. Mushtaq also had the full range of wrist spinners deliveries, and was a genuine “whirlyman” who gave the ball plenty of air. If it hadn’t been for him, compatriot Intikhab at Surrey, and Robin Hobbs at Essex we would never have seen any leggies at all. For Mushtaq there was one particular Test that is indubitably his and that is the one played at Port of Spain in April 1977. Captaining Pakistan Mushtaq lost the toss and Clive Lloyd invited him to bat. An unusually dogged 121 from their skipper helped Pakistan to total 341 against an attack led by Andy Roberts, Colin Croft and Joel Garner. West Indies surrendered a first innings lead of 187 in the course of which Mushtaq took 5-28. He added 56 more runs in his side’s second innings, and he took three more top order wickets in the fourth innings as Pakistan won by the convincing margin of 266 runs. As for Sadiq he was another opener, although unlike the Little Master he spent his entire Test career at the top of the order. He was a late developer, being almost 15 before making his First Class debut and 24 before he made the Test side. At the end of the day his average of 35 from 41 Tests is not particulary distinguished, but at a time when there were some distinctly useful opening bowlers plying their trade in the game the fact that he played Test cricket for more than a decade speaks volumes. In view of the success that the brothers enjoyed it is surprising in many ways that the next generation, and there were a number of boys, did not produce a richer crop of cricketing talent than it did. Only one made a career out of the game, Hanif’s son Shoaib who, given that over a career of 45 Tests he averaged slightly more than his famous father, has always seemed to me to have had something of a raw deal when it comes to recognition. Like the old man he was an opener and, also like Dad, he had seemingly unlimited patience. Unlike Hanif however he was generally surrounded in the team by attractive strokemakers so his sheet anchor role did not seem so crucial. There may yet however be a rise in Shoaib’s stock if, as seems a distinct possibility at the moment, his 20 year old son Shehzar emulates Dean Headley and Bazid Khan by following his father and grandfather into the International game. So reflecting on my original question where did the Mohammad family get their talent from? I find it impossible to disregard the hereditary factor but perhaps that is only a minor point. After all Ameer Bee had an 80% success rate at producing Test match players, and it was so nearly 100%. She was of course a talented sportswoman herself, but even assuming her daughters-in-law weren’t, surely if hereditary factors were important the five boys would have produced more than just one Test player between them. I suspect therefore that the more important parental gift is encouragement, even discipline, and that as with most desirable things in life, hard work and practice are the real keys to success on the cricket field. I have a cousin that made Natal, mostly because his dad pushed them like hell and because they went to Maritzburg. I think. Excellent read! I always felt that having a family excell at anything (sports, arts, a particular profession like being a doctor) was 80% due to the environment of that household being focused on that skill. A kid growing up surrounded with that skill, and having “experts” he can learn from, has a better chance of exceeding in that skill as well. The other 20% is that skill passed down in genes IMO.